The Design & Innovation Awards are one of the prestigious awards in the field of mountain biking. During a two-week workshop, over forty industry experts from ten different countries select the most innovative and best products of the 2016 season. Only products that are outstanding and that pioneer new innovative technologies will be awarded. Following the GE1, and the GA2 Grip, the BE1 backpack, and now the Ergon BE3 Enduro backpack has been crowned with the internationally recognized award. 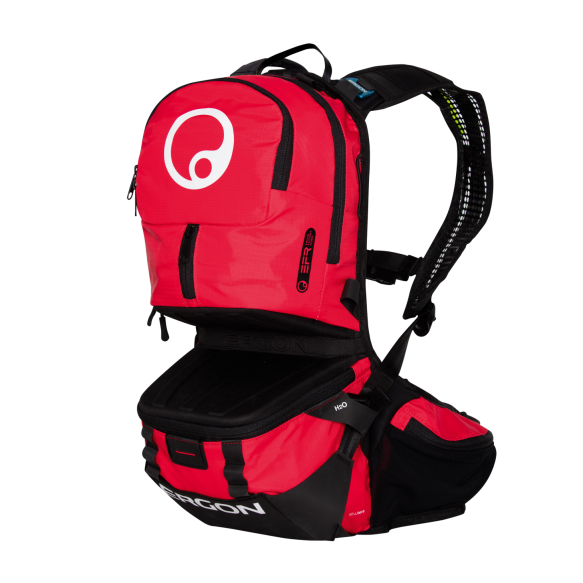 “The Ergon team has demonstrated their powerful expertise in developing premium-quality backpacks like the BE3 Enduro.“ —statement of the expert jury The BE3 Enduro backpack is available for local and online retailers starting mid-March. Perfect Fit. In All Riding Positions. The back-adjustment of BE3 Enduro was developed in partnership with engineer and 3x Downhill World Champion Fabien Barel. It is available in two sizes including a 4-position back length adjustment. Riders with a height of 1.55 m to 1.95 m can adjust the suspension system to suit their individual anatomy in just a few simple steps. Flexibility in the back while riding is achieved by the flexible middle section made from a lightweight molded foam. Full-face and standard helmets can be fixed quickly, securely and close to the pack. The patented, self-adjusting shoulder straps that compress the load towards the lower back. The pack always provides a body-hugging fit, regardless of the load volume, and has a 10 liter capacity. The BE3 is the perfect daypack for Gravity-riders, whether its a touring day trip or just a trip to the bike park. Offers body-specific adjustment of the back section with the 4-way adjustable back length. The BE1 is available with carrying system in sizes S and L: Maximum Ergonomics for body sizes from 1.55 m to 1.95 m.
The angle of the shoulder straps in self-aligning for comfort in the shoulder and chest area. 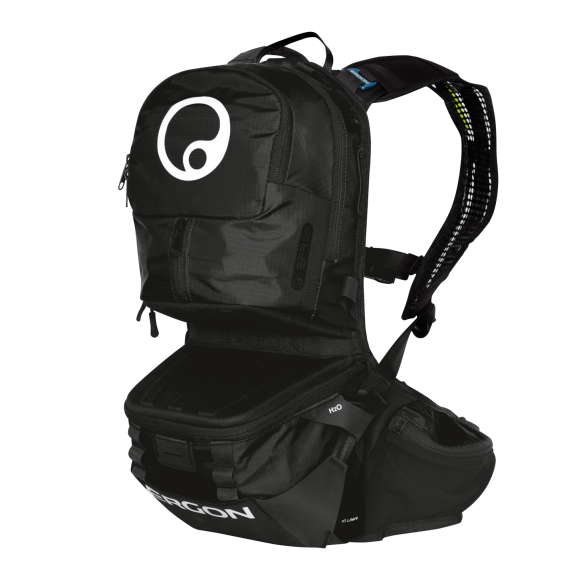 Patented Ergon shoulder straps with load-compression function. Unique stable connection at the lower back through the load enveloping “baby carrier principle“. 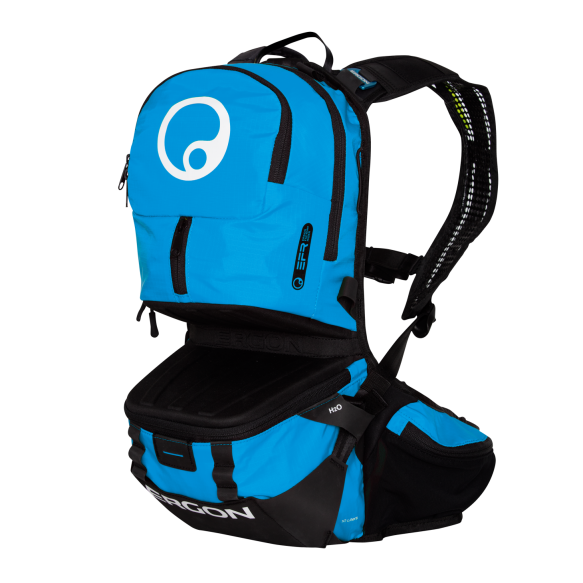 Ergon BE3 Enduro Backpacks—Compact 2.5 liter / 85 fl.oz. horizontal hydration bladder, pack load supported in the lower back for lower center of gravity and increased stability. The hygienic polyurethane bladder carries 2.5 liters / 85 fl.oz. of liquid. The extra long and taste-free hose measures 127 cm. Integrated carrying system can carry a full-face or open-face helmet. Helmets are easily and quickly attached by the marked loops. The all-purpose fastening system on the hydration pocket enables easy installation of protectors, clothing, or other equipment. An integrated loop on the center of the backpack makes it possible to attach a tail light. The certified BP100 back protector can be added to the backapack. It fits into a designated pocket and helps to protect against back injuries. The BE3 Enduro has 10 liters of storage, which is enough space for a rain jacket, tools, a spare tube, and more. The front compartment is easily accessible and features a pocket specific for keys. The provided rain cover can be put on quickly and easily to protect the backpack from rain and dirt.